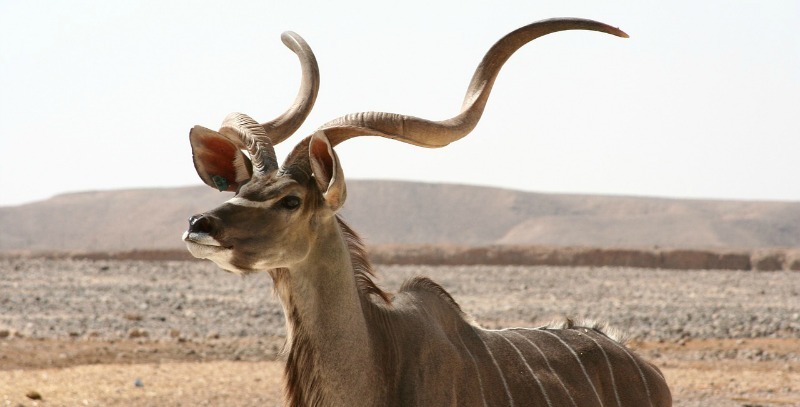 Ready for some interesting kudu antelope facts? 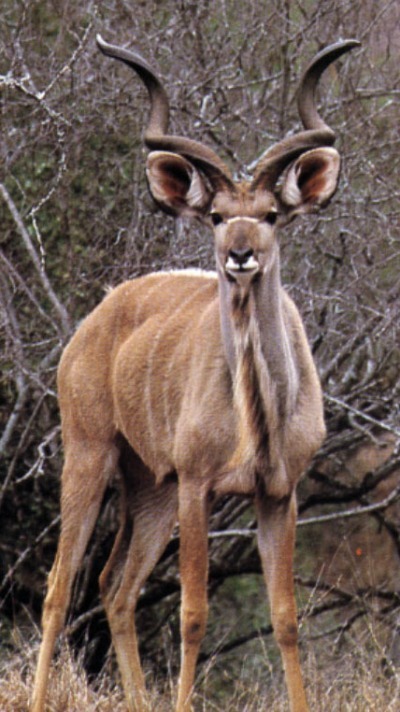 In Africa the Kudu is famous for its fence-jumping abilities. They can jump a 3 meter fence easily and even 3,5 meters when doing it under stress. This is a tall and majestic antelope. Males are fawn grey while females have a cinnamon color. Old males become greyer and darker in the neck area during breeding season. They have a single white stripe down the middle of the back as well as 6-10 narrow white stripes across the back and down the flanks. Both sexes have a short upright mane from the top of the head to the shoulders. Savannah woodland, including rocky areas. They browse on a wide variety of forbs, bushes and trees. They feed below 1,8 meters. You will see that they only browse for about a minute on a tree before they move on to the next. If leaves are out of reach you will notice that the bulls break down branches with their horns. They can make serious damage to crops. Kudus are very alert and nervous animals. They spend nearly all their time hidden in thick bush. They usually stand very still and are very difficult to spot. When disturbed in the bush habitat the animal will move away quietly or dash off after giving a loud, sharp alarm bark. They move surprisingly quietly through dense bush. As they run the bulls lay their horns back close to the shoulders so that they do not hit overhanging branches. The tail is curled up over the back exposing the white underside. This serves as an alarm signal and a marker for the rest of the herd to follow. Kudus are normally active in the early morning and late afternoon. In developed areas they become nocturnal to escape hunting. They live in small herds of up to about a dozen but large numbers can sometimes be seen at water holes. Are these very social African animals? The composition of the herd changes during the year. They are not territorial animals. In the mating season males and females occur together. The rest of the time the sexes are separate. The females stay in their herds and the males live singly or in bachelor groups. Social grooming happens in all type of herds. What are the breeding habits of these African animals? 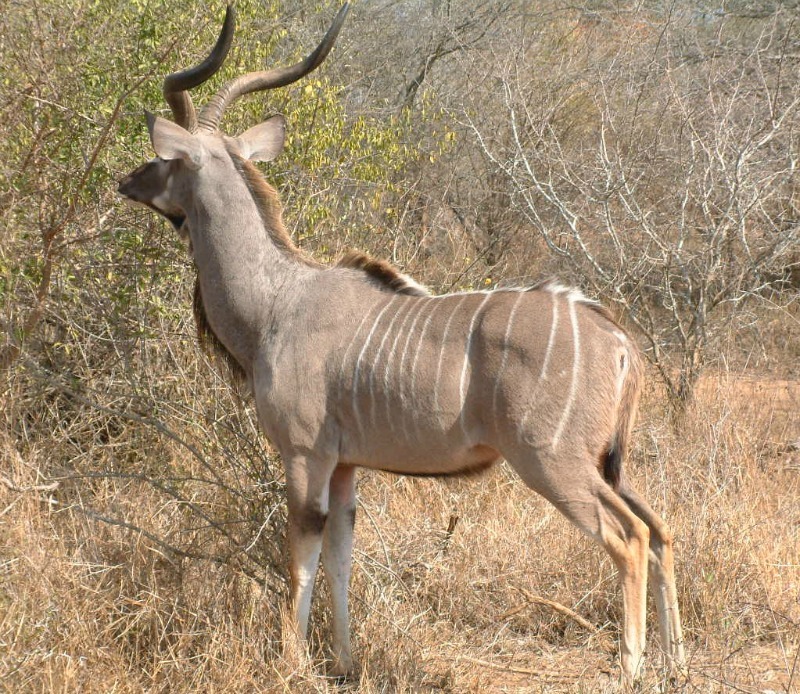 Kudu usually mate between May and August. A bull checks the reproductive condition of females by sniffing of her urine. The bull follows her with his head stretched forward and his horns back. He stands behind her with his neck on the female rump. They mate only once for five to ten seconds. Cows leave the herd to give birth. A calf is usually born in tall grass. Its mother returns to her herd and visits the calf to suckle it three to five times a day. The calf stays hidden for one to two months. The get weaned at six months. How is dominance established among kudu bulls? Dominance amongst the bulls is based on size and fighting skills. 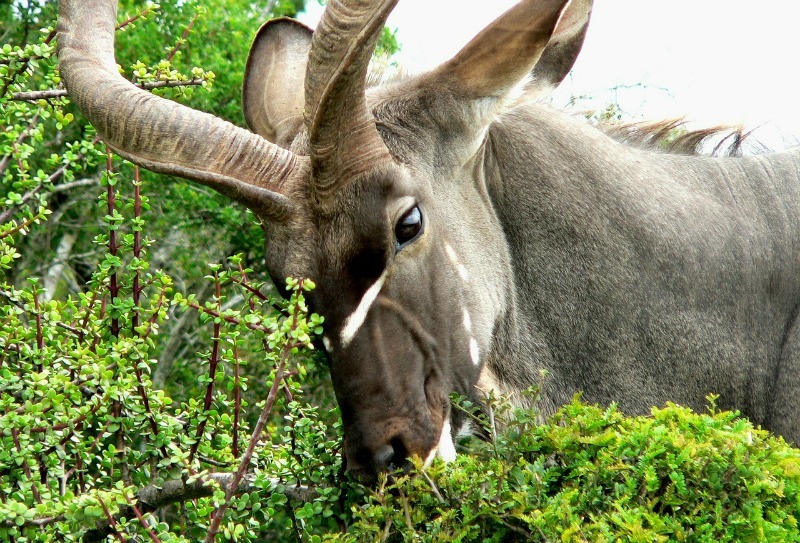 The males thrash bushes and dig up soil with their horns. Bulls compete for access to female herds displays with their horns vertical and manes erect. Fights between males are rare. Confrontations start with display in which one male stands sideways in front of the other trying to make himself look as large as possible. If they do enter into battle it involve wrestling with locked horns. They generally do not charge each other. Fights last for up to 15 minutes. The winner is the one that manages to push his opponent backwards or catches him off balance. The loser will be chased for about 500 m before the winner returns to the females. Deaths do occur from the stab wounds. Breeding bulls may tolerate young males. Young males show their subordination by grooming themselves or by looking away from the old bull. Which predators hunt these African animals? They are important prey for African wild dogs in the Hwange National Park where they make up to 23% of the African wild dog kills. They make up 15% of spotted hyena kills in the Kruger national Park.